Vasiliy Lomachenko, (12-1, 9 KOs) will once again have his skills on full display come Friday night. The unified Lightweight champion will have both his WBA and WBO titles on the line when he takes on former title holder Anthony Crolla (34-6-3, 13 KOs). This isn’t the high profile match fans were expecting to see Lomachenko in but nonetheless it’s what we’re getting. Since losing back to back bouts against Jorge Linares, Crolla has rebounded nicely with three straight victories. Those wins weren’t just against unknown opponents either. Ricky Burns, Edson Ramirez and Daud Yordan aren’t exactly murderers row but they are more than respectable opposition. The former WBA belt holder has faced his fair share of great fighters. However, in the case of Lomachenko, he will be facing someone who is unanimously recognized as the best fighter on the planet. Most have already ruled Crolla out, and with good reason. In just 13 professional fights Lomachenko has plowed through the competition. With two Olympic gold medals, over 390 wins in his amateur days and multiple titles in several divisions, Lomachenko is a talent we have seldom ever seen. Crolla has heard it all before. He has always been doubted. He was never supposed to box again following his traumatic accident in 2014 where he attempted to stop burglars at a neighbors home. Crolla beat the odds. How about his title challenge against Darleys Perez? He was given no chance, yet he not only won but he stopped the champion in the fifth round. Crolla than went on to defeat Ismael Barroso in his first title defense when yet again many thought he could not get it done. His matchup against Lomachenko follows the same theme that has followed him his entire career. Doubt him if you want, but he may just beat the odds yet again come Friday night. In the co main event we have an interesting matchup. Current WBO Super Middleweight champion Gilberto Ramirez, (39-0, 25 KOs) is moving up to Light Heavyweight to take on Tommy Carpency, (29-6-1, 18 KOs). On paper it is a matchup that Ramirez should dominate. However, with the current champion moving up in weight the added pounds could play a factor in the contest. Since winning the WBO Super Middleweight title in 2016, Ramirez has had a forgettable reign. Through no fault of his own he has not been able to secure big fights. 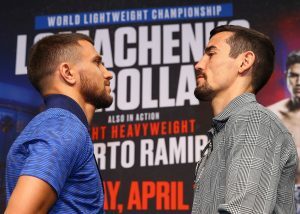 Although his matchup with Carpency is not considered a significant matchup by any stretch of the imagination, it is a contest where if all goes well, could see Ramirez challenge for a title later this year. Ramirez has the height, power and skill to make an impressive run in his new division. Carpency on the other hand isn’t looking to simply collect a paycheck come Fight night. He has rattled off three consecutive wins and will be looking to once again challenge for a world title. Carpency, to his credit, picked up the biggest win of career in 2014 as a massive underdog when he took on former pound for pound fighter Chad Dawson. It will take that sort of spirited effort from Carpency if he intends to defeat Ramirez. A win for either man could place them in title contention.